The journey continues. As you all know, I’m partnering up with Dermalogica this year and their global campaign My face My Story. I like the initiative of showing the diversity of needs and wishes when it comes to skincare. Instagram is sometimes very streamlined within the skincare community. I’ve felt the pressure to use and like “what everyone else is liking” and I often get bored of seeing the same brands getting super hyped for three months and then disappear from the radar. I very rarely buy those products anyway. Not because of the hype itself but because they seldom matches my urgent needs. For this particular campaign I’ve decided to focus on the issues and challenges that emerges when you, like me, wear glasses on a daily bases, or sunglasses or simply got very sensitive skin near the eyes. As a quick reminder of the lowdowns, I’m focusing on all parts of the face that you would see covered if wearing a sleep mask; eye area, bridge of the nose, upper part of the cheeks, side and skin around the ears. For a lot of reasons, I’m struggling to keep these areas free from congestions, see them well hydrated and protected from the sun as well as environmental damages. The wear and tear of glasses or sunglasses against the skin doesn’t make it easier for me and with sunny and sticky climate I can always see how much the skin of my eye area is suffering. Previous articles in this mini-series of mine can be found Here! Now the turn has come for the spritzing part of the series. I want to introduce to you the Dermalogica Antioxidant hydramist; part of their AGESmart® range. There is no secret that I love a good mist, spritz, toner or what have you. I’ve never cheated with this part of my routine and for two reasons: first of all I’ve got severely dehydrated skin and secondly I can’t think of living in this warm climate without having a mist to sooth and protect my face. Many find the step of a toner to be unnecessary. Why spend money on “water”? what does it really do? I say please please, add a toner or a mist into your routine and you’ll quickly see the difference with your own eyes. All mists come with different properties and effects but one common factor is that after you’ve cleansed and even exfoliate your skin, the pH-balance of your face is disrupted and your skin with new fresh skin cells revealed, is vulnerable. A mist will help you to get your pH-level in order, hydrate the fresh skin and prepare it for accepting other products in your skincare routine; those that will be applied for treatment purposes. The Antioxidant hydramist is a strong cocktail of antioxidants and anti-inflammatory properties designed not only to refresh and hydrate the skin, but to also assist our skin cells with their collagen production. In order to stimulate collagen formation you’ll find Magnesium Ascorbyl Palmitate in the mix and the star ingredient of the mist – Pea Extract – which is not only known for its cell communicating properties, it is also anti-inflammatory and together with White tea, Licorice and Beta-Glucan it sets up a comprehensive defence against free radical damage. Here in Dubai where my sensitive skin around the eye meets wind filled with sand, humid air and sun rays mixed with pollution from heavy traffic I’ll say I’m in desperate need for it! We all lust for our skincare to provide us with precious peptides and the mist holds both Arginine/Lysine Polypeptide and Palmitoyl Tripeptide-5; both which will firm up your skin and tighten things up. I find that my enlarged pores around the bridge of my nose (which sadly gets even more visible via my specs) appears to be more “in control” with a little spritz of this wonderful mix. Normally with a lot of skincare brands, they have to write out “product not suitable for the eye area” and I guess it simply has to do with avoiding a lawsuit situation. I personally use all my toners and spritzers for this area in particular, as the skin there is both dehydrated and dry. I need all the assistance I can get! Great to know with the Dermalogica Antioxidant hydramist is that it is free from artificial fragrance and colours. 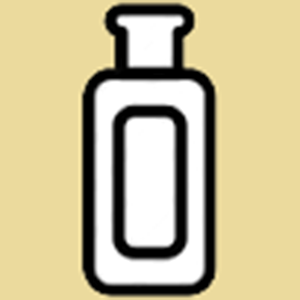 The divine scent that you can detect comes from Clove and Rose oils, both with soothing effects on the skin. You also get some Aloe Extract for the sensitive area and the Licorice already mentioned will assist a little bit with dark circles. It won’t erase then, but it will have a positive effect on the tone. I know that a mist makes all the difference for me with my small congestions at the bridge of my nose and around my ears where the frames are constantly leaning. The skin texture improves and the serums, oils and creams that I’m about to apply next will transport easier into my skin and stay there. 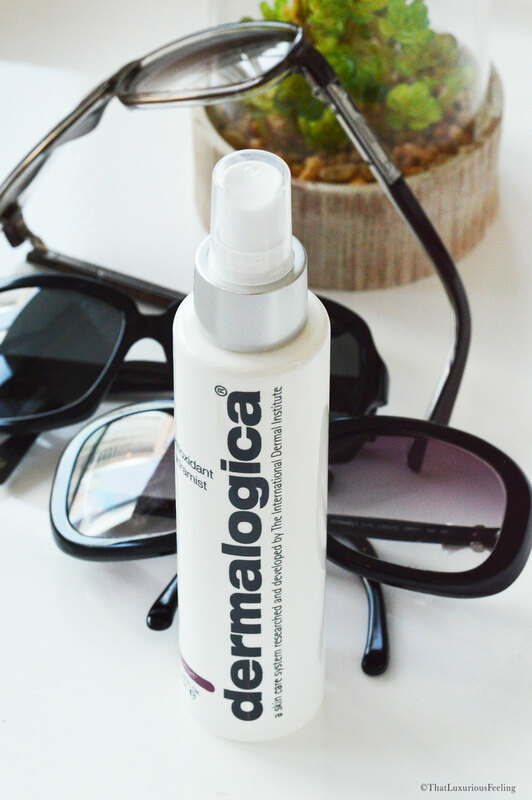 As said there are many types of mists and I’ve already written an article before about the Dermalogica Ultra-calming mist. Nowadays I prefer to use that one for my nighttime routine or at the poolside and the Antioxidant hydramist for my morning routine before makeup application. I find that makeup sits well upon this product as it makes my skin hydrated but not moist. My lips are not sealed!